It seems that the sugar rush starts mid-October and continues until after Christmas. 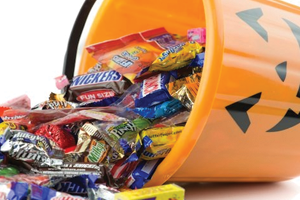 It’s fun to have candy around Halloween, but continued exposure is bad for your teeth. Your kids love candy, but if they eat too much, their treats might turn into tricks the next time you take them to the dentist. When you eat sugar, some of it sticks to your teeth. Bacteria in your mouth reacts with the sugar to turn into acid. Acid eats away at tooth enamel and eventually leads to cavities. The more candy sticks to your teeth, the worse it is. Carmel, nougat, and taffy stick so well there’s sometimes still residue after brushing. Make these types of candy a once-in-a-while treat or avoid them altogether. Eat something nutritious before trick-or-treating so you don’t overindulge on candy. Roll out a whole wheat pizza crust and top with pizza sauce. Cut ghost shapes out of reduced-fat cheese and use sliced black olive pieces for ghoulish eyes. Bake according to the directions that come with your pizza crust. Swap out packaged cupcakes for this healthy option. Pumpkin has high levels of fiber, potassium, and vitamin C. These pumpkin oatmeal muffins are high in fiber and made without refined sugar. Slice mozzarella cheese sticks into thirds. Cut one half of each cheese piece to create fringe. Insert a pretzel stick in the other end to make these adorable broomsticks. Buy small clear plastic cups and let kids decorate the outside with a Sharpie. Fill with banana slices to make a spooky ghost. Draw on a jack-o-lantern face and fill with mandarin oranges. Sketch a glowering Frankenstein and fill your cup with green grapes. Cobblestone Park Family Dentistry helps families keep their teeth healthy year-round. We offer custom care for every smile. Call us today to find out more.